MAGS’ staff, students and their supporters have so far helped to raise $98,500 for the Cancer Society through the charity event Relay for Life. 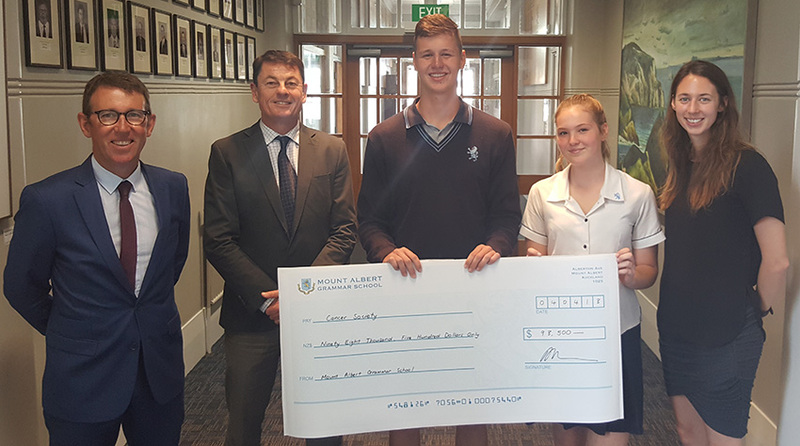 Today, MAGS’ Relay for Life organiser and teacher Alayna Pulham, pictured right, joined Headmaster Patrick Drumm and students Sophie Rippon and Oscar Graham to present a cheque for $98,500 to John Loof, second from left, the CEO of the Auckland North Cancer Society. The Relay for Life was held at Millennium Institute on the North Shore on March 10 & 11, with 292 MAGS students running a total of 25,000 laps. There were at least four students who ran over 200 laps: Ella Gillooly, Theo Brown, Bailey Bennett and Thomas Brendolise, who ran the most laps with 219, which is more than two marathons. And there were 133 students who ran over a marathon across the night which is equivalent to 105 laps around the track.